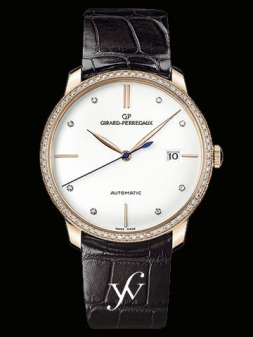 One of the oldest watch companies in the world, Girard-Perregaux dates back to 1791 via its predecessor J. F. Bautte. A series of mergers and acquisitions resulted in the Girard-Perregaux of modern times, but the quality, innovation, and style born centuries ago remain as the guiding forces for the company today. As one of the first watchmaking companies, the Girard-Perregaux artisans have developed many "firsts" over the years. * The gold Lépine watch, ordered by Léopold II, Grand Duke of Tuscany, was created by J.F. Bautte in 1826 and firmly established the house's reputation. * In 1880, Girard developed one of the first wristwatches, upon order of Emperor Wilhelm I of Germany for naval officer use. The result was the first large-scale production of wristwatches in history. Not until 1930 would the sale of wristwatches surpass the sale of pocket watches. * Girard-Perregaux developed and manufactured the first high frequency mechanical movement, making 36,000 vibrations per hour. Haute Horlogerie: The Haute Horlogerie line includes watches whose movements have technological complications like the minute repeater, perpetual calendar, moon phase, split-seconds chronograph, and Tourbillons. Some movements in this collection have several of these complications. The Tourbillon version has a three gold bridges on the case featuring two sapphire crystals, through which the watch's movement can be seen. A hand-sewn crocodile strap provides the final touch. Vintage 1945: GMT Chronograph As the name implies, this line was introduced in 1945. It was reintroduced into the collection in 1995 with some upgrades in various versions. This model has a retro appeal and a curved ergonomic case. The GMT chronograph has a rectangular case and comes in an automatic column-wheel chronograph. It features a full-skin, hand-stitched crocodile strap with a gold buckle. Richeville: Chronograph Lady Launched in 1992, this tonneau shape is simply elegant. The watch is an automatic large date, moon phase indicator. The small seconds model comes in a yellow, pink, or white gold case. The mechanical movement with its bimetallic rotor can be viewed through the transparent case back and the date is visible in the large window at 12 o'clock. Copyright © 2001-2019 Finest Watches Inc. All Rights Reserved. Finest Watches is not affiliated with Rolex USA or any other brand listed on the website. Finest Watches is not an official Rolex Jeweler. Finest Watches is the sole warrantor of these watches. Receive instant updates when we acquire new watches.